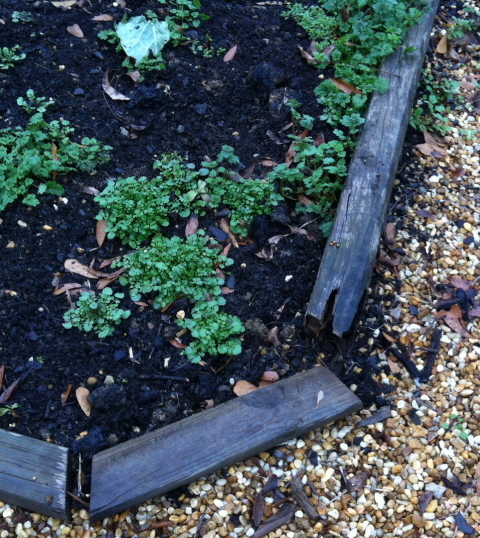 Before and After—Revisiting the Sites of Articles Past – Johntheplantman's stories, musings, and gardening. I think my adopted art form has five dimensions. There are the usual three—depth, width, and height. I like to add the dimension where you stand inside the creation and look at it from that viewpoint (I’m not sure, though, if that is a dimension or a perspective). The next dimension is that of time. If the plants don’t croak they grow and change the total feel of the project as time goes by. My main professional compensation other than making a modest living is to visit the projects after a period of time and enjoy the changes. This past week I said, “Wow” several times. Several times this past week I found myself in the presence of sites that I have written articles about. Everything has changed—as gardening projects have a habit of doing. At any rate, here are some pictures of my visitations during the first week of December, 2013 and the links to the articles that tell about the inception of the projects. Here is a picture of this delightful garden after the clean up and rebuild. A year after the building of the vegetable garden it was added on to. Go to: The Garden Gets a Gazebo from May 9, 2010. I started this blog series in 2009 and one of the first articles was about building a portable rock garden. 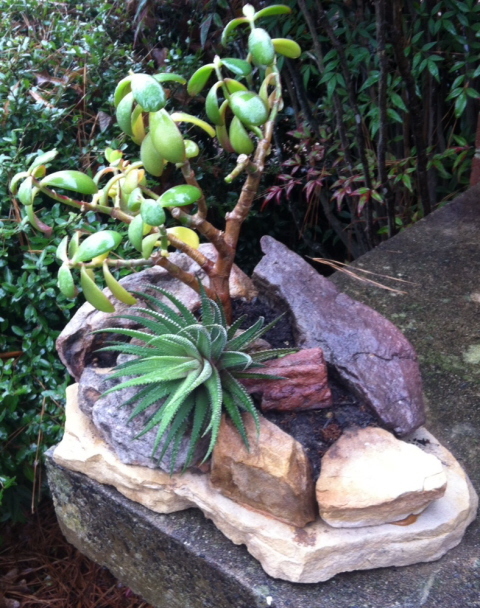 I presented the finished rock garden to my future father-in-law for his birthday. He has kept it alive and asked me a couple of weeks ago to take it and shape it up. All I’m going to do is give it some light, fertilize and prune it, and it should be all right on its fifth birthday. Here’s the “how to” article: How to Build a Portable Rock Garden from Jan. 17, 2010. 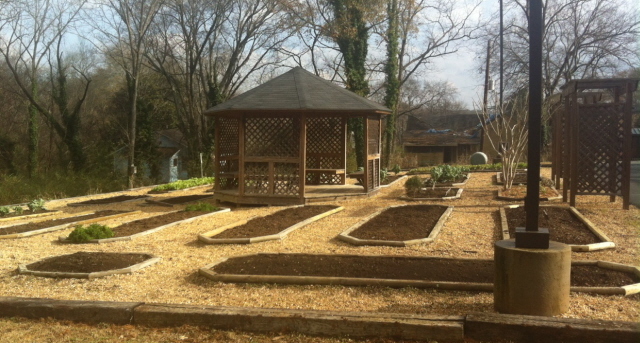 And here is a picture of the garden on December 8, 2013. I have probably been gardening for Betty for thirty years or so. 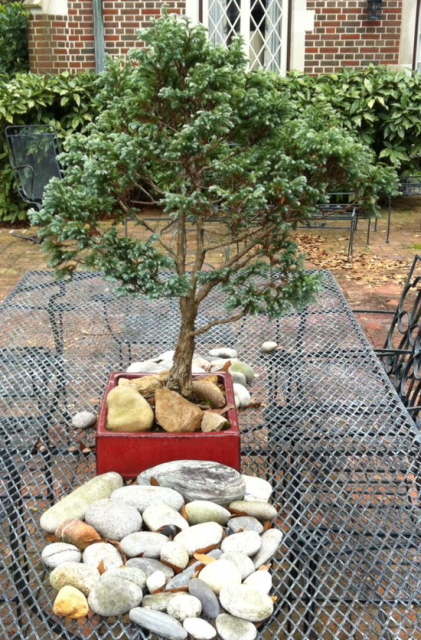 I took this picture of one of her bonsais on Dec. 7, 2013. Then I remembered that I had written an article including this plant on August 13 of this year that contains a picture of me pruning this very same tree about 20 years ago. See if you can find me. Here is the article—Pruning For Betty from Aug. 13, 2013. 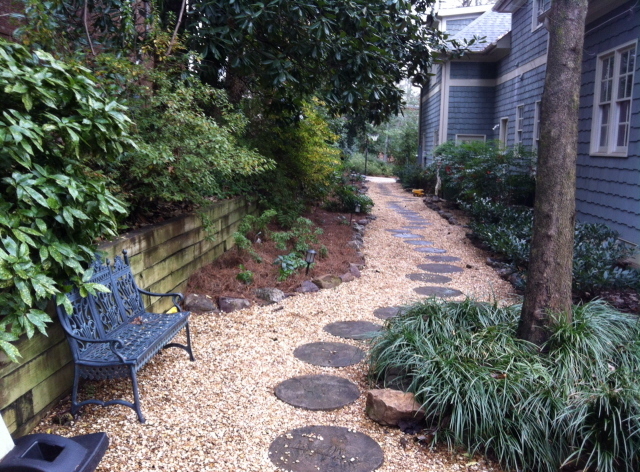 And, Oh, over the years, Patricia’s landscape garden in Buckhead is looking better and better. 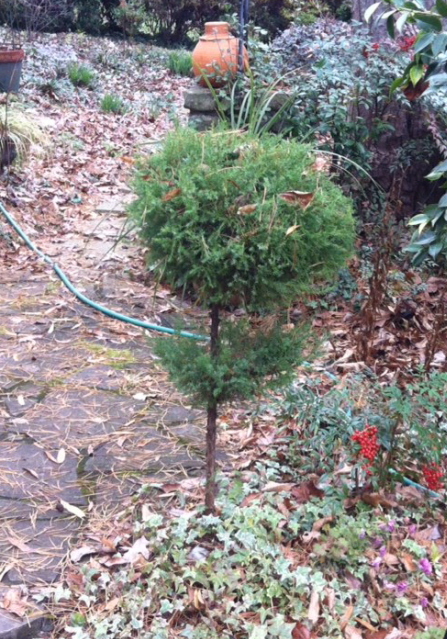 We did some clean up work and pruning Dec. 6 and 7 2013 and I took the picture below. There are two articles that relate to this garden: Making Stepping Stones With Whiskey Barrel Rings from October 2, 2011 and part two of the project, Patricia’s Side Garden from October 9, 2011.